Sen. Miriam Defensor-Santiago says the Cybercrime Law is “unconstitutional.” But Justice Secretary Leila De Lima insists it is “constitutional.” Do you still remember when Leila De Lima was out there defending fundamental human rights like free speech? Me neither. 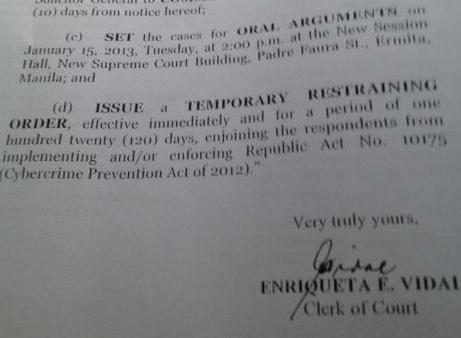 The good news is the Supreme Court has voted unanimously to stop the implementation of the Cybercrime Law. The bad news is the High Court has yet to issue a TRO on Tito Sotto’s never-ending “Ako ang favorite whipping boy… ” rant. It was a unanimous vote by the magistrates of the Supreme Court. As long as they’re UNITED against the unconstitutional provisions of the Cybercrime Law, I really don’t care if they’re DIVIDED during flag ceremonies. Thank you Supreme Court! In a scathing anti-RH Bill editorial, UST’s official student publication, The Varsitarian hit Ateneo and La Salle professors who were supportive of the bill calling them “intellectual pretenders.” The Atenean and La Sallian professors retaliated by proofreading the article. Reports say 15 nurses were dismissed for ‘liking’ a Facebook status of a colleague who criticized the management of the Taguig-Pateros City District Hospital. The Taguig City administrator denied the allegation and insisted that the nurses were fired for “disregard of authority,” “disobedience,” and for rejecting his Facebook friend request repeatedly. According to a recent study, Congolese have the longest manhood while Indians, Chinese, Thais, and North/South Koreans have the shortest. The study didn’t cover the Philippines… much to the relief of Filipinos. 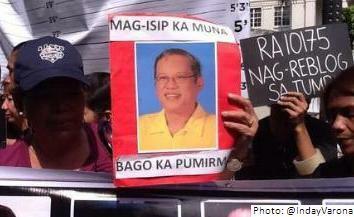 Disgrace on p-noy for prioritising and defending the bill, and not even being prepared to listen to his bosses. His card/agenda is clearly marked. Only wanting to hear ‘good news’ is not the trait of a leader or reformist, or someone who can handle problems. The controversial status on Facebook was last August, so hindi naman covered sa RA 10175. Justice for the 15 nurses of Taguig District Hospital. Victory screech for the bloggers. Think before you vote or sign, Congress. Bukas, October 11, the RH bill will be decided upon a basketball game in UAAP’s basketball finals for men (Ateneo v UST). Take your pick! If Ateneo wins, the RH bill is to go. Kung USTe ka naman, delay na naman! Let me just share a great bill-in-the making idea of Sen Guingona: https://www.facebook.com/photo.php?fbid=420996091289295&set=a.111452745576966.16292.103868143002093&type=1&theater … not a bad way to encourage participation; thus preventing another questionable bill to be passed into law. These posts make my day every time. Without humor, matagal na sigurong nalagas ang buhok ko sa stress. Kaya ito, tawanan na lang natin ang mga lintek.